Of course Cellular City sounds like the name of a crappy cell phone kiosk. 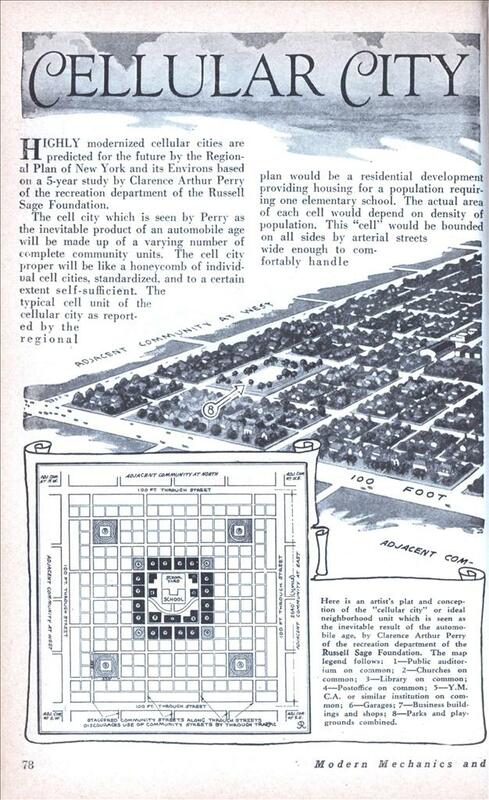 HIGHLY modernized cellular cities are predicted for the future by the Regional Plan of New York and its Environs based on a 5-year study by Clarence Arthur Perry of the recreation department of the Russell Sage Foundation. The cell city which is seen by Perry as the inevitable product of an automobile age will be made up of a varying number of complete community units. The cell city-proper will be like a honeycomb of individual cell cities, standardized, and to a certain extent self-sufficient. The typical cell unit of the cellular city as reported by the regional plan would be a residential development providing housing for a population requiring one elementary school. The actual area of each cell would depend on density of population. This “cell” would be bounded on all sides by arterial streets wide enough to comfortably handle all through traffic. The “cell” would include its own system of small parks and recreational spaces, large enough to accommodate the population of the cell only. Sites for the school, postoffice and other service institutions would be grouped in the center of the “cell.” One or more shopping districts adequate to serve the population of the neighborhood unit Would be located in the circumference of the “cell,” preferably at the traffic junctions and adjacent to similar districts of adjoining neighborhoods each laid out on the same general scheme. The unit should be provided with a special street system, each highway being designed to facilitate circulation. Irvine, California! Although the study forgot the all-important parking lot. It looks like a QR code. Well Irvine would like you to lose the car, but hey this is Southern California– how else are you going to get around. City planning is about rationing resources. This sort of came true in areas like the L.A. basin; a lot of little cities butting up against one another. The special street system turned out to be freeways. Looks like most of the Tampa Bay area in Florida. 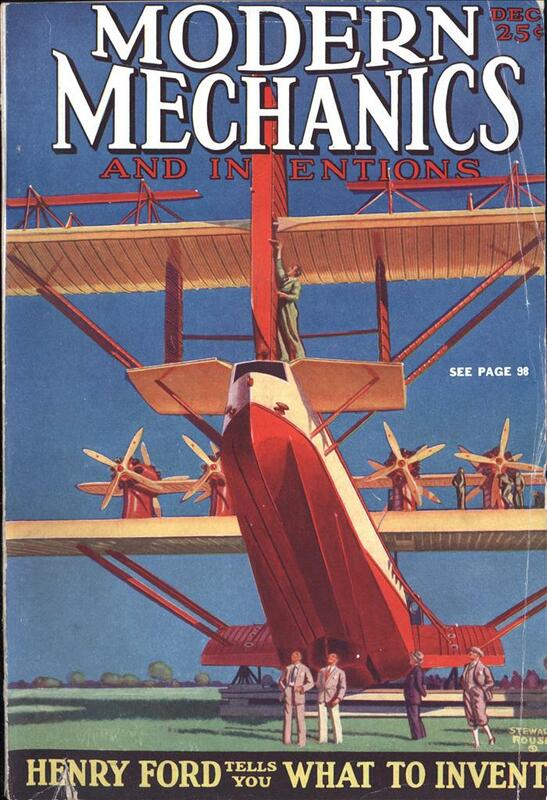 Which didn’t really come into existence until the 1920’s. All laid out in a grid with the school in the midst of the residential area and retail confined along the adjacent highway. what they failed to predict was the economic collapse of the inner-city. How did we go from this to the silly “you can’t get there from here” mazes of twisty little passages that most modern subdivisions seem to be? In southern California most all of the main roads refer back to the 1800s, when LA was just a conglomeration of Spanish Land Grant Ranchos. That’s why they go in all crazy directions as they follow the boundaries of the old ranches. this plan does not take into consideration of the rich and the poor of society. everyone in this town is middle class. where do the poor people live? this idea reminds me of communism at its worst. Thanks for the links “Firebrand38” Goes to prove my hypothesis on the designer’s agenda correct. On the contrary “DouglasUrantia” this plan does take into consideration the poor of society quiet well. It already lacks the proper disposal of human waste both biological as well as consumerism trash. Also with the neat grid makes quite easy to setup fences to keep people in line. And those parking garages could easily be modified to have Guard towers at the top to “protect” the occupants of the city from a High vantage point. Great for SWAT snipers. earthlings. I believe, I saw an updated version of his concept in one of your more recent issues in 2000 or 2001.